September 17, 2014 - Carpe Diem officially becomes a chartered chorus of Sweet Adelines International! March 28, 2015 - Region 11 Chorus Champions and Small Chorus Champions! Carpe Diem becomes the smallest chorus in Sweet Adelines history to win a regional championship with 20 singing members on stage. 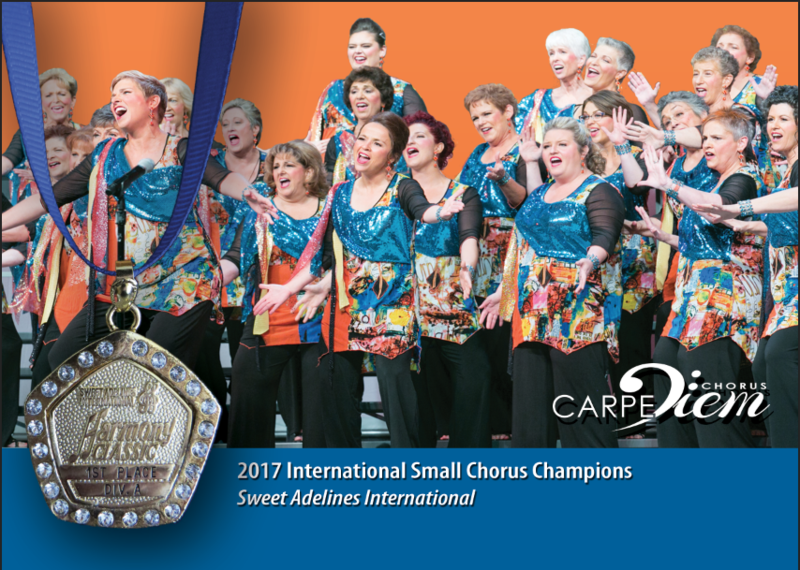 October 18, 2016 - Carpe Diem becomes the 2017 International Small Chorus Champions in Las Vegas! April 1, 2017 - Carpe Diem wins the Region 11 Chorus Championship for the 2nd consecutive time, and will compete at the International Competition in October 2018. October 10, 2017 - Carpe Diem will do our 2016 International gold-medal winning performance as Mic Testers for the 2017 Harmony Classic in Las Vegas!